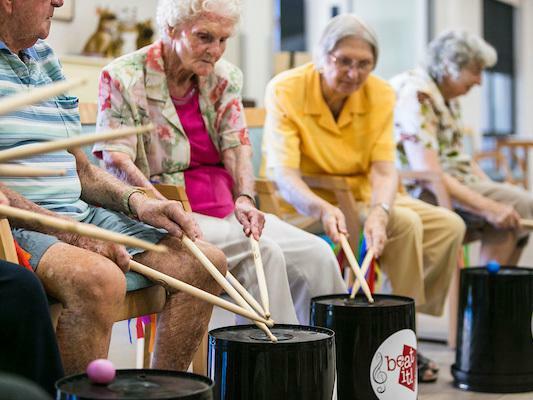 Residents at Whiddon aged care villages along the New South Wales coast are finding their rhythm again thanks to 'music enrichment' sessions. Former music teacher Jo Cook hosts drumming workshops at Whiddon's Belmont and Redhead locations. Former music teacher Jo Cook has designed a drumming workshop to encourage residents to interact, keep active and boost endorphins after being involved in a university research program which explored how music and movement can be an effective therapy for dementia. Now her full-time profession, Jo’s workshops, which she hosts fortnightly at Whiddon Belmont and Whiddon Redhead just south of Newcastle, have become so popular that the group size has tripled since the program launched in late 2017. Originally buckets, drumsticks, egg shakers and ribbons were used, but balloons, scarves and beanbags have since been added to challenge the residents’ coordination and reflexes. “(The workshops) encourage the residents to move in ways they don’t in their everyday activities,” Ms Cook says. “There are also many social benefits through sharing their favourite music, singing together and making eye contact with residents around them. A typical session starts with a warm-up involving scarves to encourage arm movement, together with upper body twisting and singing. To further challenge the residents, a clap is added between throwing and catching bean bags and balloons. “I love coming down, the more the merrier,” resident Keith Leitch says. “I do enjoy hitting the balloons,” adds fellow resident Beryl Derkenne. According to Dementia Australia, being physically active, mentally challenging your brain and remaining socially active are important elements to maximising brain health - benefits which Ms Cook says participants can get from her workshops. “It is extremely rewarding to do this program,” she says.